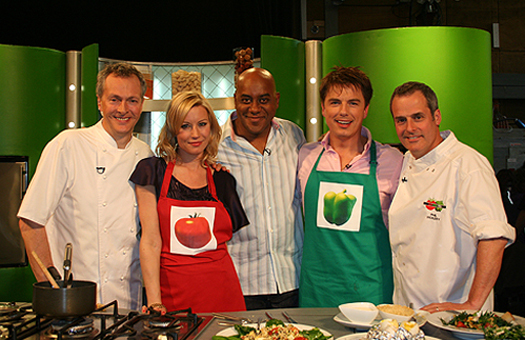 Representing the Green Peppers, John joined forces with celebrity chef Phil Vickery to battle Denise van Outen of the Red Tomatoes in this quick-fire cooking and chat show, hosted by Ainsley Harriott. John's menu included pan-fried ostrich with creamy mushrooms, Bombay sweet potatoes and red wine sauce, and a warm mango tart with caramel chilli and whipped cream. This yummy menu had the studio audience salivating - and gave a resounding victory to the Green Peppers!